"Overall... I am very pleased with the products and will likely expand the typres of products that I create and purchase. Your delivery is unbelievably efficient and fast! There exists problems in the cropping tool area of your template. Your cards are on veery good card stock and the envelopes are of high quality. This is a major reason for my renewed business. I hope the other cropping and colour issues can be addressed and resolved to make the products return tpo thoer original high level of quality and value to my business." 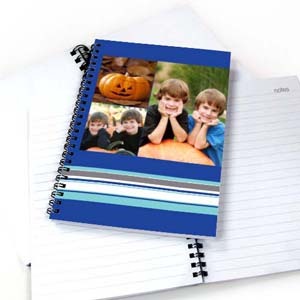 Create diaries, address books, notebooks and notebook gifts for every occasion online with PrinterStudio! Our photo notebook features sturdy front and back cover, ruled or blank pages and a durable black spiral binding. To create your personalized notebook, choose photo notebook from the menu, select template you like for the cover, inside front, inside back and the back of your notebook and upload pictures from your computer or favorite photo-sharing site to our builder. You can then use our online editing tools to drag and drop pictures and add your custom message to the template. With all these options, you’re sure to create the notebook that’s right for you and for your gift recipients. Inexpensive paper notebook gifts are a great giveaway for business customers, back to school gift ideas, wedding party favors, and birthday gifts for kids.